Little, Brown Books for Young Readers, 9780316020893, 192pp. Whether readers love poetry, riddles, and rhymes or just like to laugh, this richly varied collection of original poems is sure to keep them coming back for more! 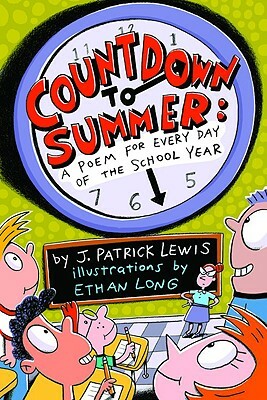 J. Patrick Lewis's fun and accessible poetry features delightful wordplay and a variety of subjects and forms featured in a compendium that counts down from the first day of school to the last. Paired with Ethan Long's lively art, these poems will have readers wishing there were more days in the school year! J. Patrick Lewis is a prolific writer of children's picture books and poetry books, including Tulip at the Bat, The Bookworm's Feast, Blackbeard: the Pirate King, and The Last Resort. Ethan Long is the author and illustrator of Tickle the Duck, Stop Kissing Me!, and Duck's Not Afraid of the Dark and has illustrated a number of other children's books including Stinky Feet Smell by Margie Palatini and Oh Yeah! by Tom Birdseye. His new animated short series, 'Tasty Time with ZeFronk' will be premiering in November on Playhouse Disney.